It’s no surprise that CES Asia’s floors are impressively filled with Chinese companies (the event is, after all, being held in Shanghai). But it might surprise many to learn that the second most visible nation is, by some distance, France. Gary Shaprio, CEO of the Consumer Tech Association, made a point of praising France’s commitment to innovation during his commencement address at CES Asia 2017. This commitment can be seen in the existence of the French Tech Pavilion, which dominates the center of CES Asia’s Start-Up Park. The focus on technology and start-ups is driven by La French Tech, a program set up by the French government two years ago to support French start-ups and entrepreneurs, both at home and abroad. The program has impressive backing from the French government, not least in the form of new President Emmanuel Macron, who has previously travelled to CES with La French Tech. China has been a particular focus for La French Tech since its creation. With the city’s historical connections with France and a disproportionate supply of Francophone expats, Shanghai is a logical place for La French Tech to try and break into the Chinese market. However, the organization has also established hubs in Beijing, Hong Kong and Shenzhen – demonstrating its real hunger to break into Chinese tech. This year’s CES Asia sees 25 exhibitors taking part in La French Tech’s pavilion, a 47% increase on 2016. Perhaps most impressive is the sheer range of sectors represented, with exhibitors including those from virtual reality, IoT and medtech amongst others. The most eye-catching of these is Elwing Boards, a Bordeaux-based manufacturer producing electronic skateboards for use during commuting. 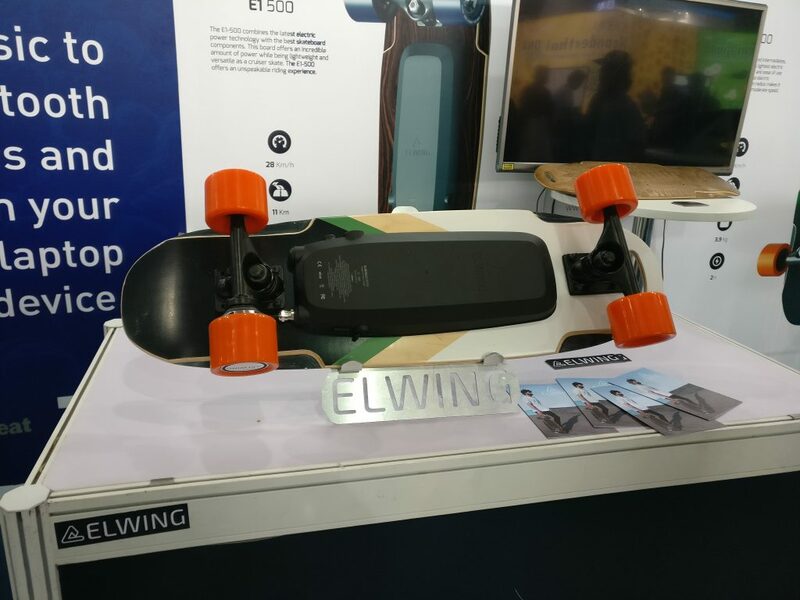 Whilst not the only electronic skateboard manufacturer at CES Asia, what makes Elwing Board’s skateboards particularly impressive is their rideability for beginners (even your correspondent managed to ride one without falling off or scattering innocent bystanders into the emergency room). Whilst much of the coverage in the tech industry is dominated by attention-grabbing and high-profile technologies, Paris-based KickMaker is an excellent example of the kind of innovation that often gets overlooked. This year the company is presenting its KickBike, an electronic bicycle system that combines light materials with machine learning that allows for the construction of electronic bicycles much lighter and less clunky than those currently on the market. 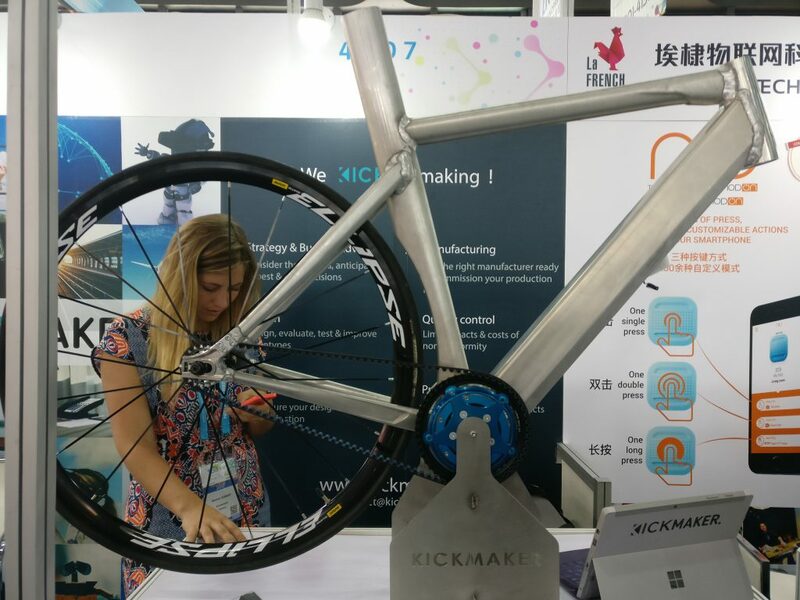 KickMaker’s offering is perhaps less flashy than other exhibitors, but it demonstrates the kind of sensible and incremental innovation that really propels industries forward. Finally, Virtuos flies the flag for the French games industry in what is perhaps one of CES Asia’s most crowded fields. Whilst there is no shortage of interactive VR demonstrations at CES Asia, the quirky and creative premises of their demonstration titles allows Virtuous to stand apart from the typical space-based shoot-em-up fair that dominates the field. Ultimately, the existence of La French Tech’s pavilion allows the French start-up community to carve a distinct niche for itself amongst the color and crowds of CES Asia. Its members undoubtedly benefit from being included, and start-ups from other similar-sized nations could be forgiven for looking on in envy and wondering why they aren’t benefitting from similar initiatives.